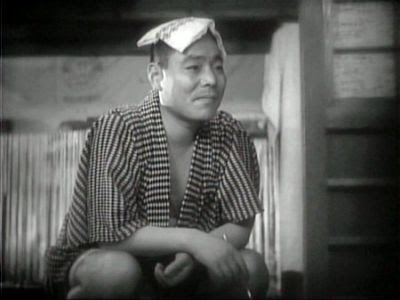 The work of Japanese director Yasujiro Ozu (1903 to 1963) is a good fit for someone used to silent film. Not because Ozu was primarily a silent director—he’s more famous for talkies like Tokyo Story (1953). Rather, it’s the man’s emphasis on visual symbols that makes him a kindred. What you see in an Ozu movie matters far more than what you hear, even though his actors talk a great deal—especially when they’re drunk. It’s just that their need to talk is more important than what they say. It shouldn’t be surprising then, that A Story of Floating Weeds (Ukikusa monogatari) differs little in pacing, structure or theme from the sound films Ozu would make for the rest of this life. A Story of Floating Weeds is about the integrity of the family; the conflict between generations; and the weight of obligation. The film opens with the arrival by train of travelling actor, Kihachi Ichikawa (Takeshi Sakamoto) and his troupe. Theirs has been a popular act for years; the townspeople great them with enthusiasm and Kihachi quickly sets about renewing old acquaintances. He hasn’t been around in four years. Kihachi is called ‘the boss’ by everyone in his impoverished troupe, but for the first half of the film, this seems to be joke. He's petulant and over-sensitive with his actors, who smirk during his acupuncture treatments. When he goes to visit an old lady-friend, we see him dressed in an all-white kimono with a white hat that looks like a washcloth. Kihachi helps A Story of Floating Weeds get off to a very funny start. His foolishness is matched by his band of greedy, venal, dirty, and largely good-natured actors, who provide us with a number of low-comic scenes, including a two-man horse costume and a kid with jock-itch. Ozu pushes hard to keep things light—consider one early scene, where a hungry actor steals money from his own son’s cat-shaped ceramic bank. The child confronts his father, humiliating him, and takes the money back. This is really a terrible set of events, but it’s played for laughs. We are not meant to sympathize with anyone just yet. It’s Kihachi’s story that brings the weight. His white-garbed travels end at a local watering hole run by Otsune (Chouko Iida), who greats him enthusiastically; she offers him a drink as soon as he enters. Next we get a succession of still-life shots (a favoured technique of Ozu’s, even in 1934): We see the kimono hanging, the hat on the floor, and the sake bottles heating. Next, we see the pair drinking together. Kihachi has changed his outfit to one much like hers. By this point in her life, Otsune ought to be bitter. Yet when Kihachi, with now-typical thoughtlessness, remarks how hard it must have been for her to raise Shinkichi alone, she almost chirps her response: “I don’t mind hardship as long as it’s for his sake.” Otsune seems so much older than Kihachi. Her face moves too fast from grin to frown to grin again. We sense she could be devastated at any moment. It is not in Kihachi’s nature to be stable, or to stay put. 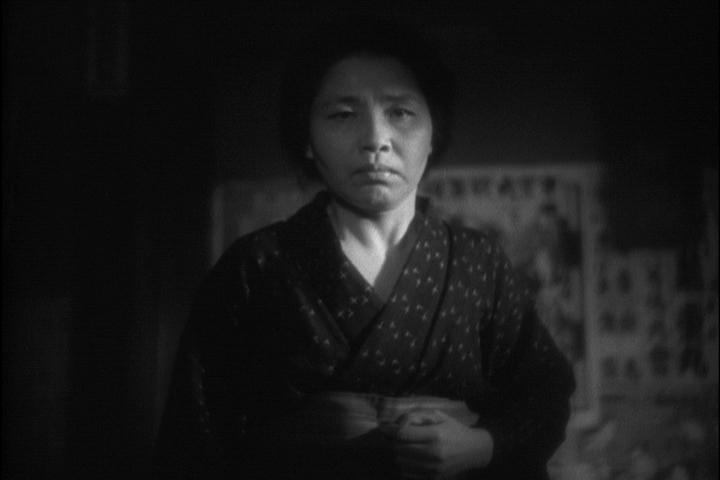 Nor is it the stream’s nature; with this early scene, Ozu establishes the film’s dominant symbol: Water. Throughout A Story of Floating Weeds, water adopts a form, or use, in keeping with Kihachi’s state of mind. The fishing stream replaces a discussion Kihachi wants to avoid. Later on, rainstorms will ruin performances and divide couples, while a boiling kettle follows a scene of rage. Water is, of course, the means by which Kihachi’s kimono gets white—notably, when things turn against him, he will be wearing black. The plot gets going when Otaka (Rieko Yagumo), one of Kihachi’s actresses and his lover, discovers her boss’ secret. She decides to pay a visit to Otsune’s restaurant with her friend, fellow actress Otoki (Yoshiko Tsubouchi). Otaka reveals nothing during the confrontation (she even hides the truth from Otoki), but Kihachi is livid. He demands she leave and she ignores him—in front of his son. Outside, they argue bitterly, with Kihachi standing under Otsune’s rooftop and Otaka sheltered on the opposite side of a street, while the rain pours between them. “Don’t think you can just walk out on me,” she warns him. “My son belongs to a better world than yours,” he replies. Otaka doesn’t care. She offers Otoki money to seduce the boy—“this makes us even,” she’ll later tell Kihachi when he discovers the plan. Otoki is flightly, and a bit loose, so it’s all in fun for her. She finds Shinkichi cycling home from school and strikes up a conversation. He is ill-equipped to manage her charms, but his positioning next to a tree branch, then his bike’s handlebars when he dismounts, make it clear he’s interested. When they rendezvous that night, she appears beneath a tree shaped liked a ‘V’. Otoki doesn’t expect to fall in love, but she does. In so doing, she’s faces the same dilemma Kihachi must have once faced himself. Is she worthy of this person? 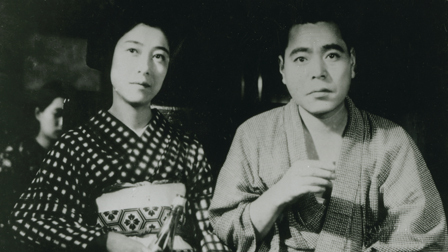 Ozu films Shinkichi and Otoki’s crucial scene against a background of hydro wires. The wires cross the screen like a musical scale; they are ordered, straight and functional, just like Shinkichi. Otoki turns instead to the train-tracks nearby, wondering where she’ll be this time next year. Soon, both Otoki and Otaka must answer to Kihachi. He confronts Otoki first. What was she thinking? What did she hope to gain? He strikes her, as we wonder whether Kihachi has enough self-awareness to loathe himself, rather than Otoki. Like all those beneath him, she laughs off Kihachi’s authority and sends for Otaka as she leaves. Otaka appears as the light rain turns to snow. She too is cold. “Life is like a lottery,” she explains. “You take your ups and downs.” He beats her and runs off. Kihachi’s conflicts resolve themselves soon after. Finally broke, his acting troupe disbands. Kihachi (now in grey) returns to Otsune and announces that he’s there to stay. Otsune isn’t just happy—she’s buoyant. She suggests a drink, which he declines. She then begins fantasizing about their new family life. “It isn’t good to be alone all the time,” she warns him, as though that had been his problem, rather than hers. She again suggests they drink. Shinkichi arrives with Otoki. His mother, oblivious to the fragility of their situation, reveals the truth to him. When he responds with predictable disgust toward his father, she is defensive. After all, was it not Kihachi who sent money home all those years to pay for Shinkichi’s schooling? And if not for fear that Shinkichi would be shamed by having an actor for a father, Kihachi could have been home all the time. She does not consider what else Kihachi could have done for a living. Shinkichi’s father, she exclaims, had to live a lie, and live in loneliness—she’s unaware that this better describes her life than his. Shinkichi bolts to his room, prompting a quick decision from Kihachi. He’ll return to the road, after all. Otsune’s response is pure agony. “Shinkichi has accepted you in his heart,” she pleads. Otoki, perhaps seeing her own future, asks Kihachi to take her with him. He declines, charging her instead with making Shinkichi a good man. He leaves her with the weeping Otsune and is gone. Ozu’s final water image is Otsune, Otoki and finally Shinkichi, crying together. A Story of Floating Weeds manages a trick—it engages us, despite a protagonist who is indefensibly selfish. Perhaps it’s the comedy. Kihachi is so easy to laugh at that we soften his actions, even though they are monstrous. This feeling continues to the end. When he finds an aimless Otaka at the train station, we know they’ll end up together, and we’re a little happy for them. After all, if justice is simply getting what you deserve, we can hardly complain about the match. In Ozu’s final shot, their train rolls out of town and into the distance; shrinking beneath the hydro wires overhead. A Story of Floating Weeds is part of the Criterion Collection, packaged with Ozu’s masterful sound- and colour-remake, Floating Weeds (1959). The DVDs are accompanied by a short booklet, explaining the background of both films and their differences. The silent film includes an audio commentary track by Japanese-film historian, Donald Richie.